Organizers promise music for every taste at this weekend’s White Beach Festival. The semi-annual Navy Morale, Welfare and Recreation sponsored party kicks off tomorrow afternoon at the sprawling east coast base, with musical genre running the gamut from punk rock to traditional Okinawan eisa. All told, music acts will be on stage 17 times during the festival, which kicks off at noon on Veteran’s Day. White Beach Festival is planned as a fun-filled day―three of them, actually ―of music, game and food booths, and a ton of activities for kids. Gates open daily at noon. The festival winds down at midnight Friday and Saturday, and at 11pm on Sunday. 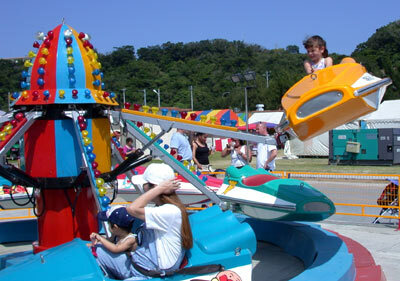 With focus on youngsters, planners have a variety of games and rides to amuse the kids. 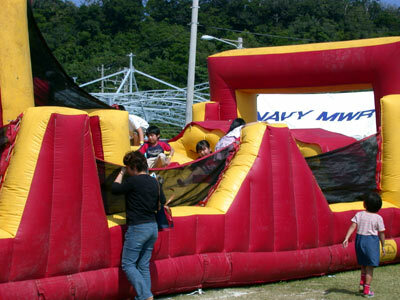 Banana Boat rides will be offered daily until 5pm, the kids’ obstacle course is open throughout the festival, and the Space Bounce, one of the island’s most popular entertainment venues, will be available, too. Entertainment, though, is at the heart of it all. The headliner act, Aba Red Ranger, will perform twice on Saturday, and again twice on Sunday. Thirteen other bands and groups provide diversity. Punk rockers Gun-Poad kick things off Friday at 4:45pm, followed by Jpop ethnic rhythm and blues Mami Yonetake at 6:15pm. Okinawa rock & roll favorites Stormwatch entertains through the evening, beginning at 8pm. The Zamami Brothers take to the stage at 1pm Saturday, belting out the oldies. Aba Red Ranger makes first appearance at 4:15pm, followed by rhythm and blues group QSB at 5pm. Aba Red Ranger returns at 6:15pm for a second performance. The evening continues with Taiko drum group Tenryu Daiko at 7pm, and rock & rollers Shima Gais at 8pm. African music from WARABA launches the Sunday stage at 2pm, with Aba Red Ranger following at 2:50pm. The pure sounds of Okinawa fill the air starting at 2:30pm, with Byron Jones and friends. Look for Ryukyu music anddance, shi shi dogs and taiko drums. Aba Red Ranger returns for a Sunday encore performance at 5:15pm. Ryukyu Buyo, a Ryukyu dance group, performs at 6pm, and Mashikiya Eisa Hozonkai plays at 7pm. Latino sounds of Banda Caribe winds down the White BeachFestival from 8:30~10:30pm.